One piece shower with "diamond tile" wall finish, 1/2" threshold and center drain. Ideal for adding accessibility during new construction our barrier free shower enables users of limited mobility to more easily step into the shower or move a wheelchair over the threshold with minimal effort. Best Bath Systems One Piece 48” x 36” Barrier Free Fiberglass Shower with .5 inch threshold and center drain features a "diamond tile" look finish eliminating the cleaning and sanitation issues of grout. 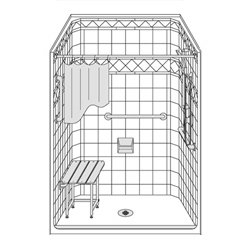 The strong, luxurious polyester gelcoat composite fiberglass shower unit incorporates a plywood core solid wall system that enables total freedom in placement of all accessories including seats and safety bars to individual needs. Each shower system is pre-leveled at the factory eliminating floor modifications and leveling headaches. Innovative leak-proof joints create trouble-free installations and add value with reduced construction requirements. The luxurious gelcoat finish is also available in custom colors or with custom accent tiles, call for details. 30 year limited warranty. Made in America. Outside Dimensions: 48" x 36" x 77-3/8"